The dynamic interactions between the various energies of life are represented on an individual level by the "aspects" in a natal chart—that is, the angles between planets and between the Ascendant or Midheaven and the planets. Aspects have been spoken of as ('lines of force'' between the various energy centers (planets) in the energy field mapped by the chart. In the birth chart, which reveals this energy field with remarkable precision, the aspects are measured within the 360° circle. We will concentrate on the most commonly used aspects—the ones occurring every 30° all of which we consider "major aspects" that are reliable and illuminating. This refers to the square (90°), opposition (180°), quincunx (150 °) and sometimes, depending upon the harmony of the planets and signs involved, the conjunction (0°) and the semi-sextile (30°). 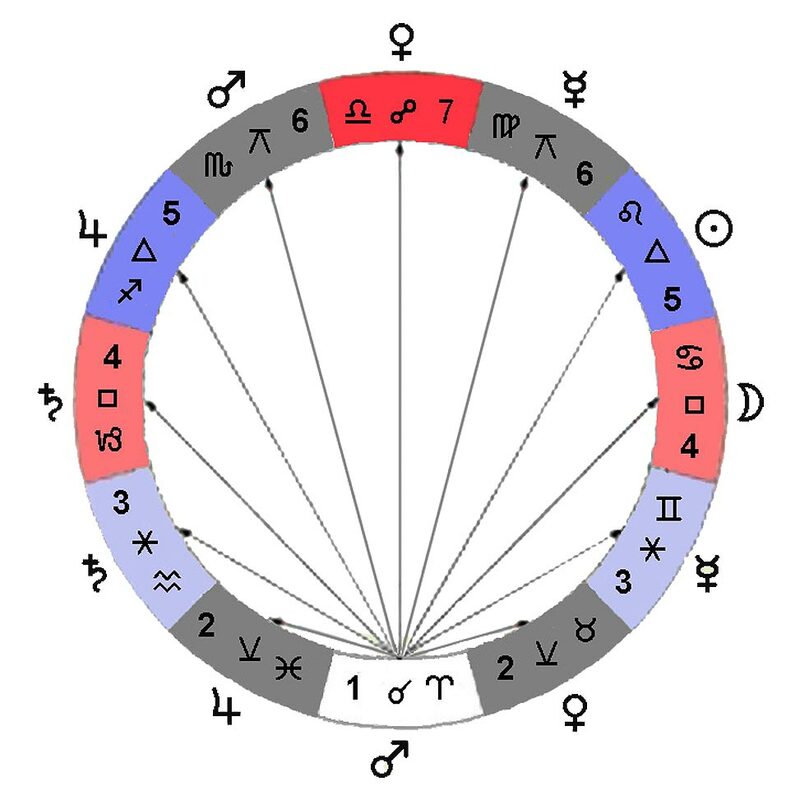 This refers to the trine (120°), sextile (60°), and some of the conjunctions (0°) (depending of the planets involved) and semi-sextiles (30°) (depending on the harmony of the planets and the elements of the signs involved). Any conjunction in an individual chart should be regarded as important, since it indicates an intense merging and interaction of two life energies. The most powerful of all conjunctions are those involving one of the "personal planets" (Sun, Moon, Mercury, Venus, and Mars) or the Ascendant. Such conjunctions always characterize particularly strong modes of energy flow and personal expression (by planet and sign) and dominant emphases in the person's life (by house). The keynote of the conjunction is action and self-projection. This is traditionally considered a minor aspect, but at times it can be more noticeable even than the conjunction, depending upon the planets involved and the other aspects to the two planets. Planets in semi-sextile are constantly interacting and building on the energy of each other. They do not usually generate the stress of a square and are in fact usually gentler in effect than the quincunx, but they are persistent and almost always in evidence if the aspect is quite close. The sextile seems to be an aspect of openness to the new: new people, new ideas, new attitudes; and it symbolizes the potential for making new connections with either people or ideas that can ultimately lead to new learning. This aspect usually involves signs of harmonious elements, and thus compatible energies. The sextile shows an area of life where one can cultivate not only a new level of understanding but also a greater degree of objectivity which can lead to a feeling of great freedom. It indicates an automatic, natural attunement and sometimes a definite skill. A trine aspect represents an easy flow of energy into established channels of expression. One does not need to build a new structure or to make marked adjustments in one's life in order to utilize this energy creatively. The planets involved in the trine reveal dimensions of life and specific energies which are naturally integrated and which flow together harmoniously. (Note that trines are commonly between signs of the same element, which is the basis for the harmony of energies.) Such an aspect often shows a way of being, however, rather than a way of doing; one often takes for granted the abilities and talents shown by the trine and thus sometimes does not feel challenged to make the effort required to use the energy constructively. This aspect indicates a strong flow of energy between those dimensions of life symbolized by the planets involved, but the individual may feel that the experience of those energies is too compulsive or consistently annoying. It is difficult to remain aware of both energies simultaneously, and one usually has to make a conscious, concerted effort to do so. Note that the quincunx aspect usually involves signs that are not only of inharmonious elements but also of different modalities. (E.g., a quincunx between planets in Gemini and Capricorn involves mutable Air and cardinal Earth—quite a dissimilarity but potentially a combination of deep understanding and practical skill.) It is important to be aware of both energies, because it often seems that the expression of are not well integrated. Dealing with this aspect effectively requires discrimination in subtly adjusting one's approach to those areas of life rather than trying to force a solution. The opposition, particularly since it usually involves planets in harmonious elements, indicates a degree of over-stimulation in the person's energy field which often manifests as a feeling of being caught in the middle of completely opposite tendencies. This is usually felt most directly as a constant challenge in the area of personal relationships. There is often a marked lack of objectivity since the individual tends to engage in “projection'' of different sides of his or her nature onto others; and thus there is some difficulty in distinguishing what is yours and what is somebody else's. Having an opposition in one's chart is similar to being stretched between two contrasting, sometimes contradictory tendencies. Opposite signs are similar in many ways and in fact complementary, but there is no denying that they are also totally opposed in many ways.